I’ve been where you are now and I know just how you feel. It’s entirely natural that there should beat in the breast of every one of you a hope and desire that some day you can use the skill you have acquired here. Suppress it! You don’t know the horrible aspects of war. I’ve been through two wars [the Mexican and the Civil] and I know. I’ve seen cities and homes in ashes. I’ve seen thousands of men lying on the ground, their dead faces looking up at the skies. I tell you, war is Hell! History repeats itself in strange ways. Take the famous, eerie monologue of Quint, the professional shark-hunter played by Robert Shaw in Jaws and partly modeled on the obsessed Captain Ahab. Quint’s chilling monologue, sometimes called “The Indianapolis Speech,” tells of how he sailed aboard the doomed USS Indianapolis in the last days of World War II. On July 30, 1945, just after the vessel delivered the components of Little Boy — the atomic bomb dropped on Hiroshima — a Japanese torpedo sent the Indianapolis to the blue depths. Out of 880 sailors who went into the water, over 500 died of hypothermia, starvation, dehydration and the scariest death of all: shark attacks. World War II came to an end just two weeks later. 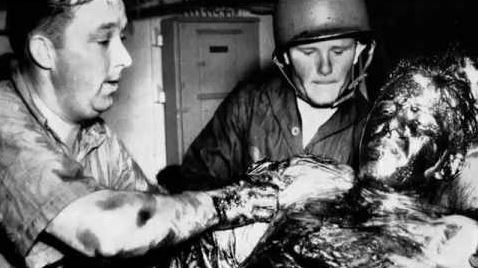 A USS Indianapolis survivor covered in oil and burns. Horrible as the loss of the Indianapolis was, it wasn’t the worst tragedy in American maritime history. 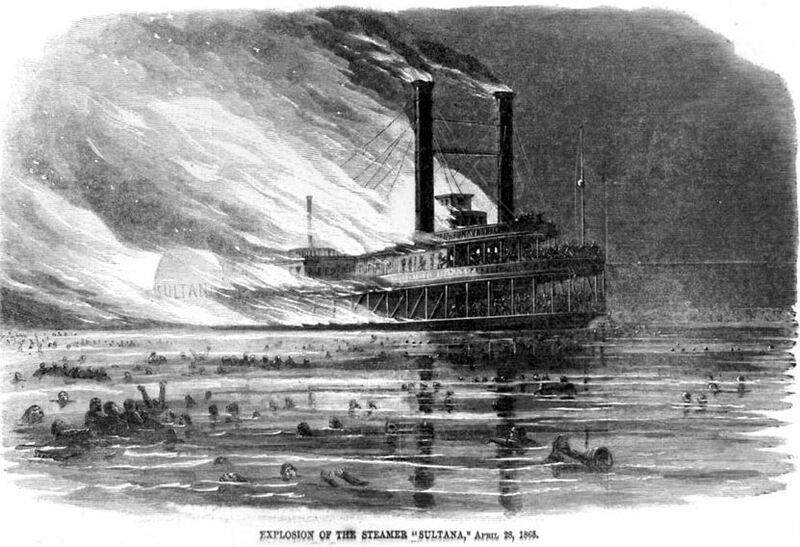 That event happened after a war was over, at 2:00 a.m. on April 27, 1865, when the wooden steamboat Sultana — loaded with exhausted, traumatized ex-POWs, many of them headed home to Indiana — exploded on the Mississippi River seven miles north of Memphis. Most investigators and historians blame overheated boilers for the blast, but one intriguing theory has it that the real culprit was a Confederate terrorist. Other strange parallels evoke the loss of both the ill-fated Titanic and the Indianapolis. The Sultana, built at John Litherbury’s boatyard in Cincinnati and launched on January 3, 1863, plied the Ohio and Mississippi during the worst days of the Civil War. At a time when steamboats carried cargo and passengers faster and more comfortably than slow-moving trains, the Daily Evansville Journal kept track of riverboat passages. Though midwestern river towns feel abandoned today, in the 1860s they were teeming with life and activity. Daily Evansville Journal, Evansville, Indiana, March 19, 1863. The Sultana mostly transported passengers and agricultural wares. Yet travel on the Mississippi River past Memphis had been cut off by the Civil War. Only when U.S. Navy gunboats helped capture that city in June 1862 did river travel start up again, finally brought back to life by the fall of Vicksburg on the Fourth of July, 1863, after an epic siege. 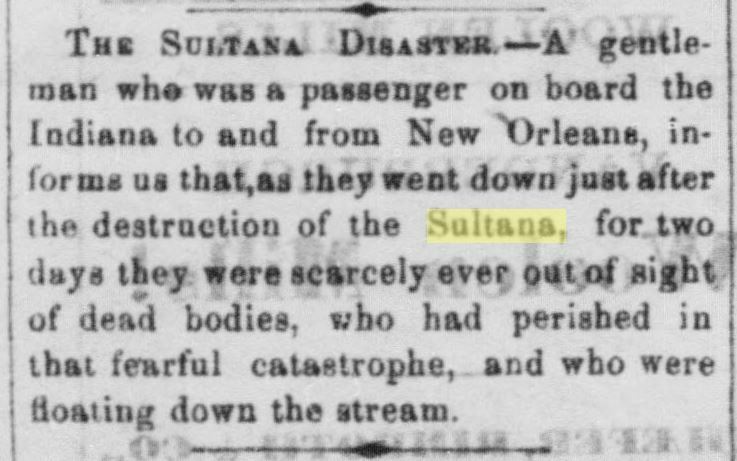 That August, the Sultana carried furloughed soldiers north from Vicksburg. But the wartime dangers of river travel weren’t over yet. Nocturnal Confederate guerrillas shot at the steamboat near Waterproof, Louisiana, in December 1863. Another boat traveling alongside it was hit with artillery shells and musket fire, provoking a Federal gunboat to fire indiscriminately into the dark woods. 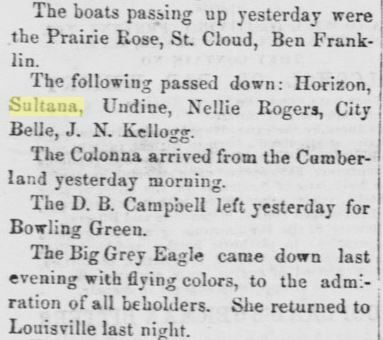 On April 15, 1865, just days after the Civil War ended, the Sultana was docked in Cairo, Illinois. Telegraph wires that morning were shooting out news from Washington, D.C. — Abraham Lincoln had died from a gunman’s wound at 7:22 a.m. 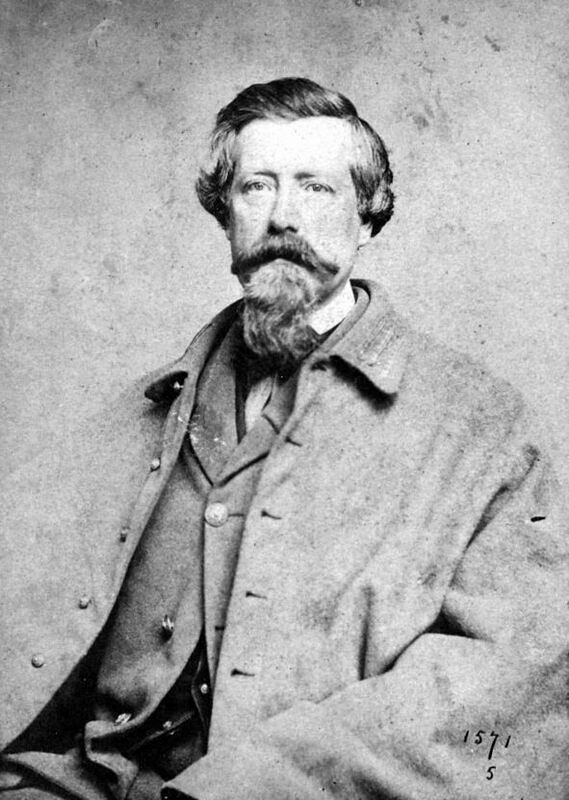 The Sultana’s captain, J. Cass Mason of St. Louis, knew that since wires had been cut all over the South, Southerners wouldn’t get the news of the assassination quickly, so he grabbed an armload of newspapers and headed for Vicksburg, arriving downstream a few days later. English photographer T.W. 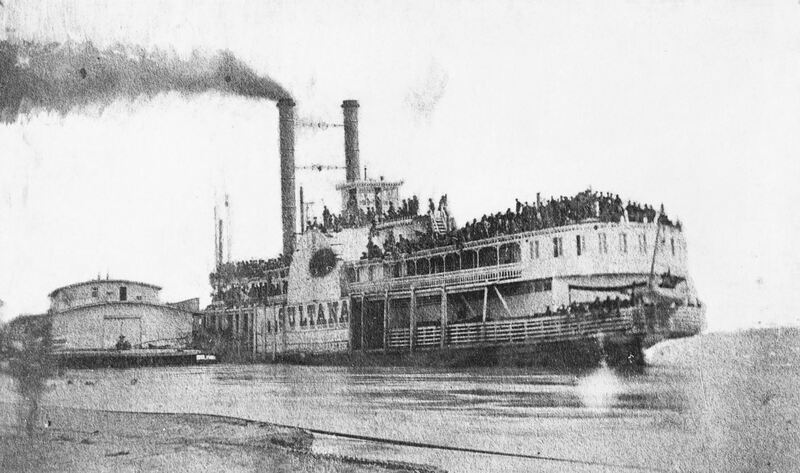 Bankes took this photo of the overloaded Sultana when it docked near his portrait studio at Helena, Arkansas, on April 26, 1865. Vicksburg’s corrupt Union quartermaster, Lt. Col. Reuben Hatch, wanted to make Captain Mason a deal. With the war over, the Federal government was offering steamboat captains $5 for each enlisted man and $10 per officer they agreed to take back north. With the South in ruins, even former Confederate soldiers from Kentucky and Tennessee found it easier to get home by going up the Mississippi to the Cumberland River, which flows into the Ohio across from southern Illinois. Hatch and Mason agreed on a deal, whereby over 2,000 soldiers — mostly former Union POWs staying at a Vicksburg parole camp — would be carried back to their homes in the Midwest. About two-thirds of them were from Indiana, Ohio, and Illinois, though others had served in Union regiments from Kentucky. Captain Mason would have netted about $10,000, a small fortune. Mason agreed to give Quartermaster Hatch a kickback. The freed POWs waiting to go home had already experienced some of the worst conditions war can offer. Most had been incarcerated at the notoriously cruel and unsanitary Confederate camps at Andersonville, Georgia, and Cahaba, Alabama, where Union POWs regularly suffered and died from diarrhea, exposure, scurvy, frostbite, dysentery, hookworm, and had to contend with abuse by prison guards and even dog attacks. By the time they made it west to Vicksburg and onto the Sultana, many ex-POWs were still recovering from hunger, disease, PTSD, and physical exhaustion — and surely excruciating homesickness, as well. Yet the worst was still to come. Private Jackson Broshears, 65th Indiana Mounted Infantry, was the son of a French immigrant father and a mother from Tennessee. 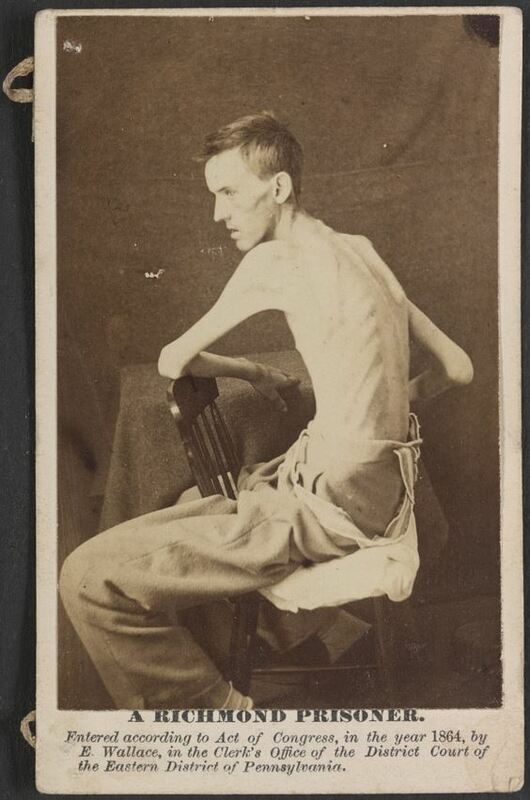 Imprisoned at Belle Isle POW camp in Richmond, Virginia, 20-year-old Private Broshears was nearly dead of starvation at his release in 1864. He died that October and was buried at Newtonville in Spencer County. The Sultana had paddled down to New Orleans before returning to Vicksburg on April 24. When it backed out of port, it carried about 2,100 ex-soldiers and civilians, alongside a few women and children traveling on the river. Some of the women were serving with the United States Christian Commission, a medical relief organization that also provided religious literature to Union troops and helped army chaplains. Passengers were crammed into virtually every open space on the boat, whose legal carrying capacity was just 376. Decks sagging under the weight even of emaciated men had to be supported with emergency beams. Yet if Captain Mason could get his boat upriver safely, he was bound to strike it rich. As the over-burdened boat chugged desperately north, it had to fight a huge spring flood on the Mississippi, which had burst the levees and spilled out for as much as five or six miles in some spots. The river, always treacherous to steamboats, had reached the canopy of trees along the banks and ran icy cold with snowmelt. The weight of the passengers caused the Sultana to roll from side to side, which probably caused hot spots in its boilers, as the water that produced steam to power the paddles and keep the boilers from exploding under heat and pressure sloshed back and forth and spilled out. Sudden pressure surges were probably the culprit of the explosion that came at 2:00 a.m. on April 27. Steamboat fires and boiler explosions were the plane crashes of the 19th century. 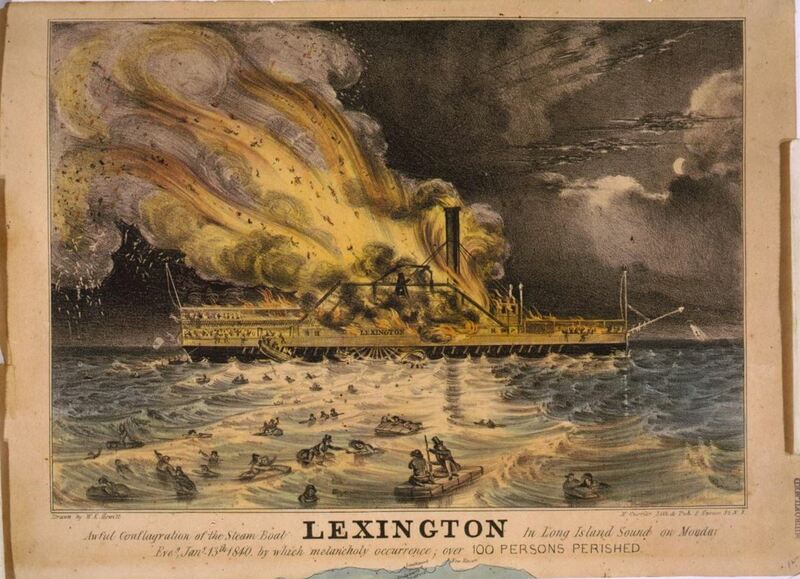 The Lexington caught fire while crossing Long Island Sound in 1840, killing all but four of 143 people on board. Poet Henry Wadsworth Longfellow missed the boat in New York. The steamboat had just passed Memphis that night, where it unloaded a cargo of sugar. Seven miles farther upriver, still fighting the massive current, the enormous blast occurred, followed by a fire that hit the coal and wood furnace boxes and rapidly turned the wooden Sultana into a blazing inferno. Some thought lightning had struck the boat. 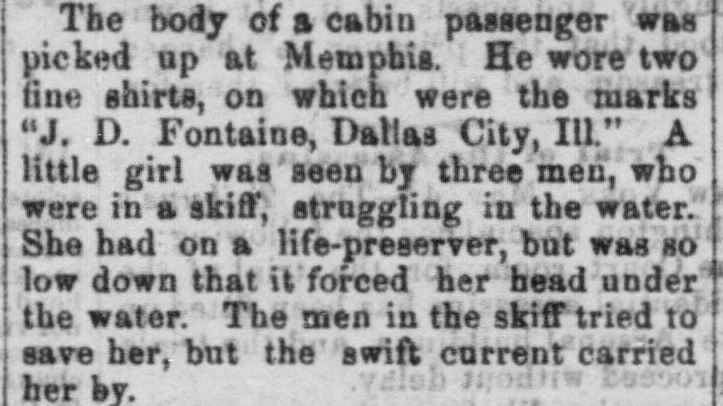 Passengers who weren’t thrown into the river were faced with a horrible choice: burn to death, or fight for their lives in the frigid, raging Mississippi. Weakened by incarceration, trauma and disease, many soldiers stood no chance. 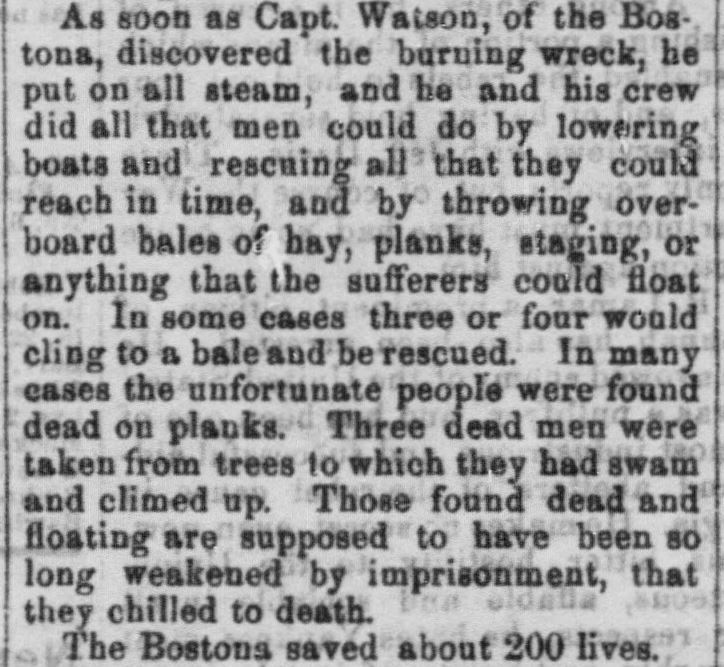 They drowned or burned, or gave out to hypothermia while clinging to debris and fighting a brief struggle in the water. The Tennessee and Arkansas riverbanks were hard to find, shrouded in darkness and high floodwaters. Survivors told of the stench of burning flesh coming off the boat. Decomposing corpses would be found along more than a hundred miles of the river for months — including Captain Mason’s, who never made his fortune. Bodies had to be picked out of trees as far south as Vicksburg. Many victims were never found. Evansville Daily Journal, May 11, 1865. When survivors and the dead began to float past Memphis, citizens and riverboat crews hurriedly paddled out in skiffs and recovered as many as they could. (It is fascinating to reflect that labor activist Mother Jones, who lived in Memphis during the war, was probably a witness.) The city hospitals filled up with men and the few women and children who were on board, victims of severe burns from steam and fire, exposure and hypothermia. A large number of Hoosiers were among the wounded and dead. 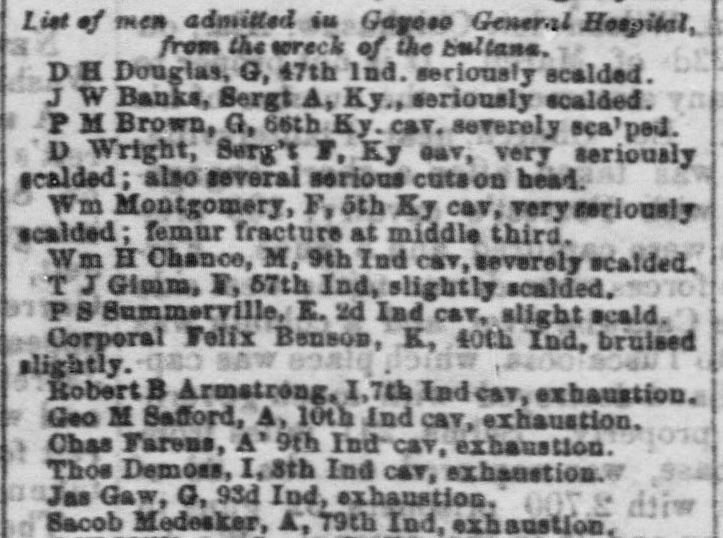 The list of men admitted to Memphis’ Gayoso General Hospital included a long list of soldiers from Indiana and Kentucky. 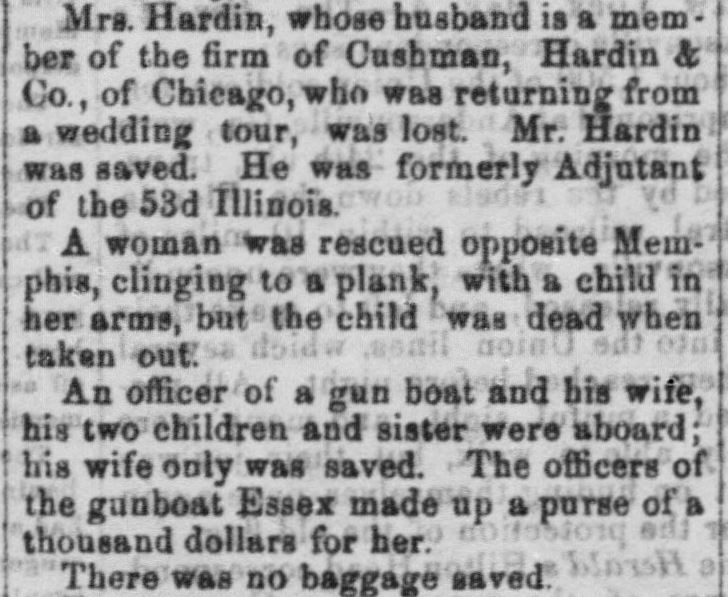 Evansville Daily Journal, May 5, 1865. Around 1,800 people died, a bigger toll than the Titanic. Yet newspaper accounts of the horrors on the river gave surprisingly few details. Like another devastating blast — the Allegheny Arsenal explosion in Pittsburgh, which blew up 78 ammunition workers, mostly young women, on the day of the Battle of Antietam in 1862 –and like the USS Indianapolis sinking in 1945, which was overshadowed by the atomic bomb, the news got drowned out by bigger events: the end of the Civil War, coverage of Lincoln’s funeral train, and the death of John Wilkes Booth, who was shot to death in a burning barn in Virginia the night before the Sultana exploded. The St. Louis Republican — a river-town paper, like the Evansville Daily Journal — provided some of the scanty coverage that made it into the press. The stories are hair-raising and gloomy. Evansville Daily Journal, May 5, 1865. William D. Snow, U.S. Senator-elect from Arkansas, had been awakened by the boiler explosion. Opening his door, he was confronted by “a large volume of steam” careening through the cabin and many scalded passengers. Snow said that as he prepared to jump ship and swim almost a mile to the Arkansas shore, the river presented itself as “a sea of heads, so close together that it was impossible to leap without killing one or more.” Amazingly, in those days before government safety regulations, Snow saw “several husbands fasten life-preservers to their wives and children, and throw them overboard into the struggling mass below.” The Senator washed up, alive, among “overflowed cottonwood lands” at about 4:00 in the morning. He was rescued by a passing steamer. Maverty watched an Irish soldier, whose face had been crushed by “flying missiles,” cry out in loud prayer, but he died just after they were dragged to shore. Grown men were seen weeping profusely as they floated among dead comrades and severed body parts. Veterans of Gettysburg and Chickamauga thought the sight was worse than things they had seen on the battlefield. A number of the victims and survivors came from Henry County, Indiana. More than a century later, a monument to 55 victims from Delaware County was erected at Muncie’s Beech Grove Cemetery. Most victims, however, were buried in Memphis. Though no one was ever prosecuted for the disaster and investigations pinned the explosion on carelessness, one theory sprouted up right away: a coal torpedo or bomb planted by a disgruntled Confederate had destroyed the boat. 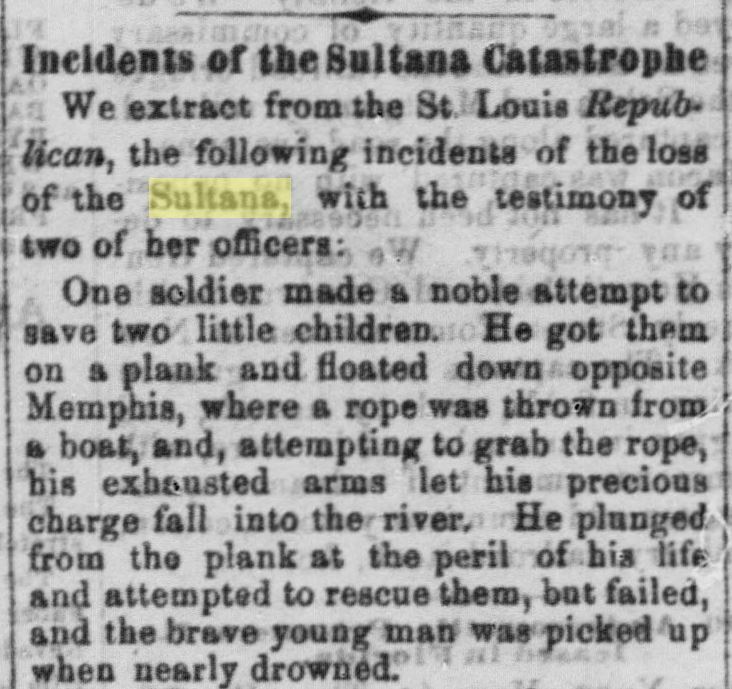 The website Civil War St. Louis even presents a lengthy, detailed (though skeptical) case for-and-against the sabotage of the Sultana. Irish-born Thomas Edgeworth Courtenay, Confederate Secret Service Agent and bomb-maker. Thomas Edgeworth Courtenay, a native of Belfast, Ireland — where the Titanic was built and launched in 1912 — had immigrated to St. Louis in 1844, aged 22, and also lived around Vicksburg. Ironically, Courtenay sold fire and marine insurance in St. Louis and even served as sheriff of St. Louis County in 1860. The Irish immigrant’s loyalties were to the Confederacy, and early in the war he joined up with the Confederate Secret Service as a clandestine agent. In 1863, Courtenay invented the coal torpedo, a hollow iron casting loaded with explosives and disguised inside a clump of hardened coal dust. Hidden in Union coal piles by Confederate saboteurs, coal torpedoes were meant to be shoveled unsuspectingly into the boilers of vessels, where they would heat up, cause the boiler to burst and lead to a larger, catastrophic secondary explosion. Confederate President Jefferson Davis approved a plan to target Union gunboats with Courtenay’s secret bombs. Several U.S. Navy vessels were actually blown up by coal torpedoes, including one in the Brooklyn Navy Yard in 1864. After the war, Courtenay traveled overseas and tried to sell his deadly invention to foreign governments, with no success. To protest the British occupation of Ireland, the Fenian Brotherhood, radical Irish nationalists based in the U.S. and Australia, reportedly considered putting coal torpedoes into furnaces in New York City hotels and aboard English transatlantic steamships. 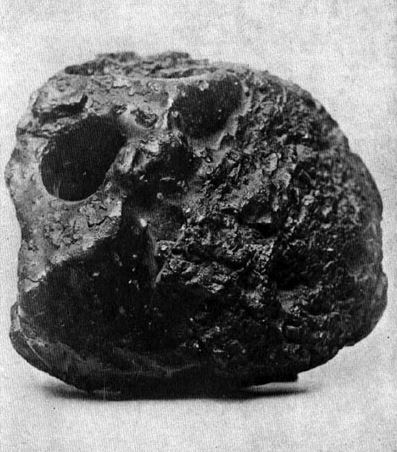 Fenian coal bombs were blamed for the explosion of a British Navy vessel in Patagonia in 1880, which inspired a short story by Sir Arthur Conan Doyle, inventor of Sherlock Holmes. This model of a coal torpedo was found by Union General Edward Ripley at Jefferson Davis’ office in Richmond in April 1865, the month the Sultana blew up and after much of Richmond itself was incinerated. As bodies started to float in, a mate aboard the Sultana told a writer for the Memphis Argus that he suspected a bomb. And during a yellow fever epidemic in New Orleans in 1867, Robert Louden, a Confederate agent and “terrorist” who sank several Union vessels on the waterfront in St. Louis, claimed on his deathbed to have planted a bomb on the Sultana — probably while its crew were unloading sugar at Memphis. Louden may have been bluffing, and the evidence is not totally convincing, especially since some of the passengers aboard the steamboat were ex-Confederates headed home to Kentucky and Tennessee. The ruins of the Sultana floated downstream a few miles, burned to the waterline, and sank in a mud bank. In 1982, archaeologists discovered what may be the steamboat’s remains — but they aren’t in the river. The ever-meandering Mississippi has moved two miles east since 1865, placing the site of the worst maritime disaster in U.S. history square in the middle of an Arkansas soybean field. Survivors’ reunions were held well into the 20th century. The last two survivors — one from the North, one from the South — were still alive in the 1930s. Though the memory of many was consigned forever to the restless river, the lights finally went out on January 9, 1936, with the death of 94-year-old Albert Norris. 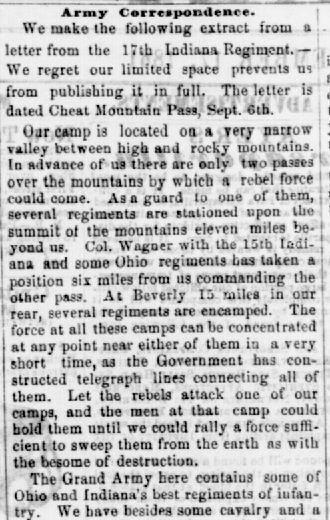 A private in the 76th Ohio Volunteer Infantry, Norris, aged 23, had been lying directly above the boilers and fell down onto the hot furnace as men came raining down around him from the hurricane deck. Though he was one of the closest to the blast, he lived the longest to tell the tale. Albert Norris of Ohio, last survivor of the Sultana, died in 1936. The Evansville Daily Journal of Vanderburgh County was established in 1834 by William Town but did not appear as a daily until 1848, a year after Evansville was recognized by official charter as a city of Indiana. Town relocated to Evansville from the east and worked as both a grammar school teacher and printer. In March 1834, he disseminated the first issue of the Evansville Journal and General Advertiser, which was a pro-Whig (later Republican) paper. He remained the newspaper’s owner until his death in 1839. William H. and John J. Chandler became the joint owners and editors of the paper in 1839. Under their management the paper was published as the Evansville Journal and Vanderburgh Advertiser. The title was eventually shortened to Evansville Journal. A year later John left the paper and his brother William became the sole owner, publishing the paper under the firm name of WM. H. Chandler & Company. William Chandler debuted the Tri-weekly Journal in 1846 and the Evansville Daily Journal in 1848. 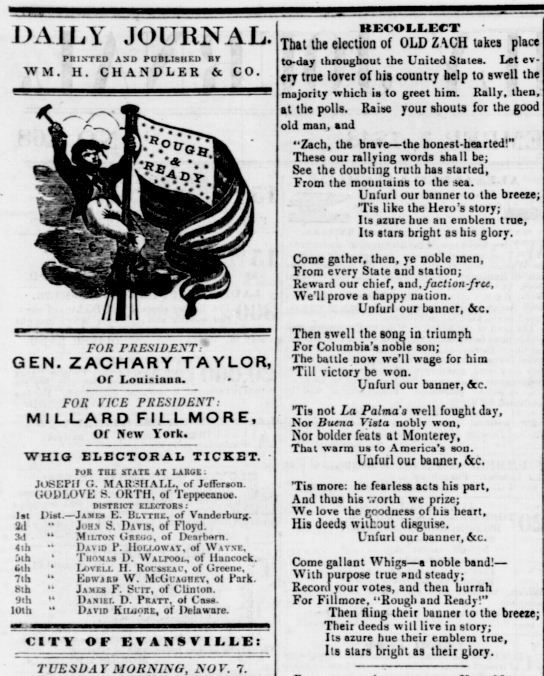 The Evansville Daily Journal endorsed Whig Party candidate Zachary Taylor in the 1848 presidential election. Taylor was nicknamed “Old Rough and Ready” for his victories in the Black Hawk War and Second Seminole War. He died in office on July 9, 1850. In 1848, Addison H. Sanders purchased the Journal from William Chandler. Sanders oversaw the increased circulation of the Journal throughout southwestern Indiana between 1849 and 1856. He focused on improving the city department portion of the newspaper. The expansion of the paper paralleled the economic growth of Evansville during the 1850s, when the population of the city grew to 4,700. White newcomers were attracted to jobs with railroad firms, saw mills, and factories. Free blacks living in Evansville (about a hundred) also held both skilled and blue-collar jobs despite being barred from coming into Indiana in 1851 by Article XIII of the state constitution. In October 1856, the Journal passed to Francis Y. Carlile. By April 30, 1858, Carlile had partnered with Indiana printers Frank M. Thayer and John Henderson McNeely. They formed the Evansville Journal Company (later Evansville Journal-News Company) and started to publish the paper under the name of that firm. Among the improvements the new proprietors made to the newspaper office was the installation of a steam engine and power press. Before more improvements could be made the newspaper office was destroyed in a fire. Its proprietors immediately arranged for the Journal to be printed from another newspaper office until it could be relocated. The company ultimately purchased a building located on Fifth Street between Main and Sycamore. Carlile left the Journal in November 1859, selling his interests to James H. McNeely. By 1860, Evansville was the third largest city in Indiana behind Indianapolis and New Albany with a population of 11,484. Under the maintenance of the McNeely brothers and Thayer the Journal advocated for the election of Abraham Lincoln for president and unflaggingly supported the Union side during the Civil War. Excerpt from a letter written by Napoleon B. Risinger, a soldier in the 17th Indiana Regiment, which was published in the Journal on September 17, 1861. John W. Foster purchased the interest of James McNeely and replaced him as partner in June 1866. Edward Tabor, a former bookkeeper for the paper, subsequently joined Frank M. Thayer, John McNeely, and John W. Foster as a partner in the Evansville Journal Company. In 1869, the Journal reported a circulation of 2,000 for its 8-page daily issues and 5,000 for its weekly issues. Claude G. DeBruler purchased Foster’s interest and replaced him as partner in November 1872. Thayer left the Journal in 1883. 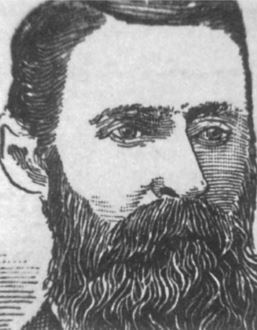 James McNeely purchased DeBruler’s interest in 1885 although he had been listed in the newspaper as a proprietor since 1883. Following the departures of Thayer and DeBruler as well as Tabor’s death, the McNeelys became the joint owners of the Journal in March 1885. By 1889, James McNeely was editor-in-chief while his brother John fulfilled the role of river editor. Jessie McDonald (later Mrs. William Torrance) eventually oversaw the society department of the newspaper. The Journal published a “Colored News” column in or near the want ads section between the early 1890s and 1909. The column had a black editor and covered goings-on in the black community such as church events as well as illnesses and funerals. Outside of the short, segregated column the newspaper’s derogatory tone towards blacks reflected the intense racial bigotry that affected the city’s black population, which at 7,405 approximated that of Cleveland, Ohio. During the McNeely brothers’ maintenance of the Evansville Journal-News Company the circulation of the Journal grew to 9,844 for daily and Sunday issues, which were 8 and 16 pages respectively, by 1900. That was more than the Evansville Courier the Journal’s pro-Democratic competitor, which had a circulation of 8,555 for dailies 10-20 pages and Sunday issues 24-36 pages, in the same year. By 1920, the Journal had a circulation of 15,765 for week-days and 12,232 for Sunday issues. The Courier surpassed the Journal that year with a circulation of 23,893 for week-days and 20,978 for Sunday issues. In 1923, the McNeely brothers sold the Journal to the Evansville Courier Company. The Courier office published its Sunday edition together with the Evansville Journal as the Sunday Courier and Journal between June 24, 1923 and 1936. The Evansville Courier Company suspended the Evansville Journal in November 1936. The newspaper’s masthead displayed slightly different titles over the course of its run including the Evansville Daily Journal, Daily Evansville Journal, Evansville Journal, Daily Journal, and the Evansville Journal-News. A former city editor at the Journal during the 1880’s characterized the paper as “a power in the republican party of the state” that supported the elections of several Republican candidates for state and federal offices including Benjamin Harrison (Senator from Indiana 1881-1887; President 1889-1893) and Charles Warren Fairbanks (Senator from Indiana 1897-1905; Vice President 1905-1909). Bigham, Darrel E. We Ask Only A Fair Trial: A History of The Black Community of Evansville, Indiana. Bloomington & Indianapolis: Indiana University Press, 1987. Published in association with the University of Southern Indiana. Bigham, Darrel E. An Evansville Album: Perspectives on a River City, 1812-1988. Bloomington & Indianapolis: Indiana University Press, 1988. Esarey, Logan. History of Indiana from its exploration to 1922. Rochester, Indiana: Tombaugh Publising House, 1981. History of Vanderburgh County, Indiana, From the Earliest Times to the Present, With Biographical Sketches, Reminiscences, Etc. Madison, Wisconsin: Brant & Fuller, 1889. Iglehart, John E., ed. An Account of Vanderburgh County from its organization. Dayton, Ohio: Dayton Historical Publishing Company, 1923. Patry, Robert P. City of the Four Freedoms: A History of Evansville, Indiana. Evansville: Friends of Willard Library, 1996. Thornbrough, Emma Lou. “African-Americans.” In The Encyclopedia of Indianapolis, ed. David J. Bodenhamer and Robert G. Barrows, 5-14. Bloomington: Indiana University Press, 1994. U.S. Bureau of the Census. “Population of the 100 Largest Urban Places: 1860.” Internet Release date June 15, 1998. https://www.census.gov/population/www/documentation/twps0027/tab09.txt . Evansville—Vanderburgh County. Newspaper histories. Library Development Office, Indiana State Library, 315 W Ohio St, Indianapolis, IN 46204. Geo. P. Rowell and Company’s American Newspaper Directory. New York: Geo. P. Rowell & Co., Publishers & Newspaper Advertising Agents, 1869. Geo. P. Rowell’s American Newspaper Directory. New York: The Printer’s INR Publishing Company, 1909. N.W. Ayer & Son’s American Newspaper Annual and Directory: A Catalogue of American Newspapers. Philadelphia: N.W. Ayer and Son, 1920.